Project obstacles and solutions: Metalsa builds automobile and truck frames for the automotive industry. 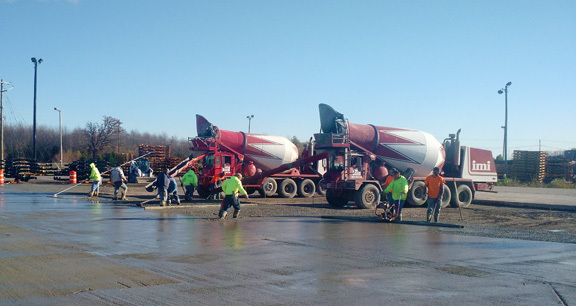 Their Elizabethtown manufacturing facility was in need of a new loading yard. The frames are stacked in the yard and lifted onto shipping rail cars. There was an enormous strain on the asphalt surface of the yard as the loaders picked up and moved the frames. The twists and turns of the lift wheels had crumbled the old surface. Metalsa hired Scott and Murphy to plane off the old asphalt and replace it with a concrete yard. However, due to the workload, the plant could not be shut down and Metalsa needed the yard operational three days after the concrete was poured. There were two critical parts to the concrete used for this project. First, it had to be durable. As a material, concrete does very well in compressive strength. A 4,000 psi concrete mix would handle the weight of the lifts and frames. However, the issue was one of tensile strength, as the wheels of the loaders would make sharp turns and actually pull the surface in opposite directions. IMI QC/QA suggested imix XS steel fiber reinforcement in the concrete at a dosage of 40 lbs per yard. Steel fiber is mixed on the truck throughout the entire batch of concrete. In this way, it gives a three-dimensional reinforcement. This is typically used to control plastic shrinkage and thermal cracking. In this case, it added the extra tensile strength to the concrete to protect it from wear and tear. The second issue had to do with Metalsa's need to be using the loading yard three days after the concrete was poured. IMI QC/QA designed a mix that would meet the 4,000 psi strength in 24 hours. They used a high range water reducer to reduce the water/cement ratio and gain early strength. IMI supplied 2,000 yards of the 24 hour mix with steel fiber for this paving project. Scott and Murphy sectioned the loading yard into three separate pours to keep Metalsa's facilities open and accessible to their operations personnel. For more information about adding imix XS steel fibers in concrete, click here. For more information on early strength in concrete, contact the IMI sales representative nearest you. Click here.